Pretty much all summer long, we have been dabbling with the concept (and now full on shoe trend) of "ugly-pretty." The term was coined from the past history of these clunky sandals as being very far removed from the world of fashion, but now, they could not be closer. To see them bubbling up again on the feet of several of our favorite fashionistas means it's time to take a closer look. At the beginning of summer, Ashley Olsen wore full-on closed-toe Birkenstocks, and Leandra Medine has been rocking her all-white Dr. Scholl's all season like it ain't no thang. From there, celebrities left and right have been supporting this shoe trend, and designers have been creating versions of their own, but this quick dominance in the industry doesn't necessarily mean we understand it—or to be more specific—understand how to style it. The term "ugly-pretty" in general is hard enough to come to terms with, so figuring out how to formulate an outfit that will naturally clique with this trend is mind-boggling without a doubt. 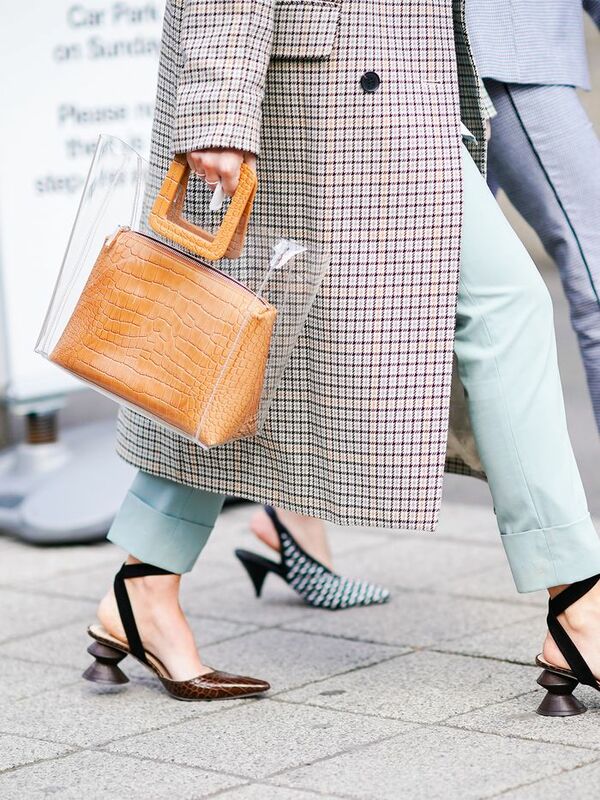 To take away any confusion you might be feeling, we have given you some of our favorite street style examples of how to style this shoe trend. As you can see from the roundup, we went for a more eclectic aesthetic because if you're going to wear a shoe that someone might call "ugly," your outfit better be on point, no? Keep reading to see how to style this "ugly-pretty" shoe trend that fashion girls cannot get enough of and to shop each of the looks! There is not one detail we don't love about this take on the classic button-down. Never be afraid to experiment with colors and shapes. This is what it looks like when comfort and fashion combine. This striped shirt is a closet staple and can be easily layered. Style a feminine floral print jumpsuit with anything from a black T-shirt to a button-down. Add a little fun to your feet with these fluffy slides. Turn heads at the office in this stand-out color. Perfect for a vacation look and beyond. No one would ever expect you to wear these with a suit. We just found this comfy shirt for all you beach babes. This asymmetric skirt will add a great amount of proportion to your ensemble. Rock n' roll with these comfortable yet edgy sandals. If you're looking for a statement piece, this is the one. Because everyone needs a striped button-down to wear with denim shorts or to the office. The built-in bow belt on these shorts is idyllic. Fashion girls cannot stop wearing this style. The bows on the shoulder are too perfect to pass up. This style is definitely blogger approved. Leave it to Acne Studios to design the coolest skirt. But seriously, how adorable are these? Check out the shoe style all the NYC girls are wearing—ring any bells?